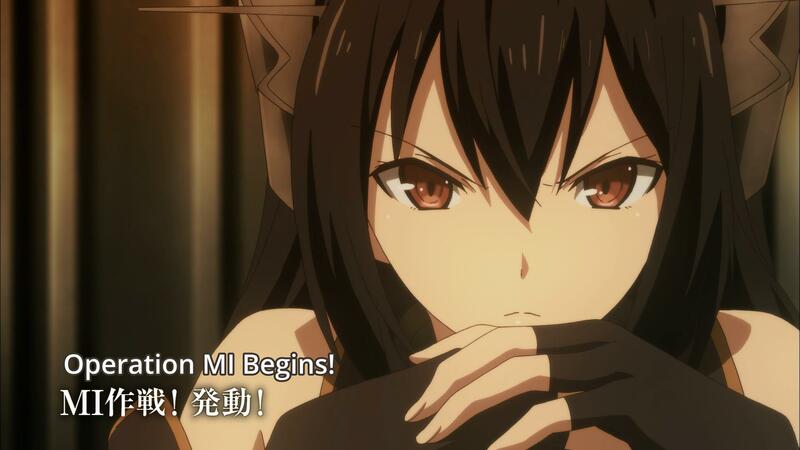 The fated Operation MI begins. Will the girls be able to turn back the inevitability of their fate, or will the addition of the most plain and vanilla main character to grace our computer screens be the one that changes everything. We shall see at the start of the final arc of this series. Akagi wakes up from a nightmare, Kaga by her side. 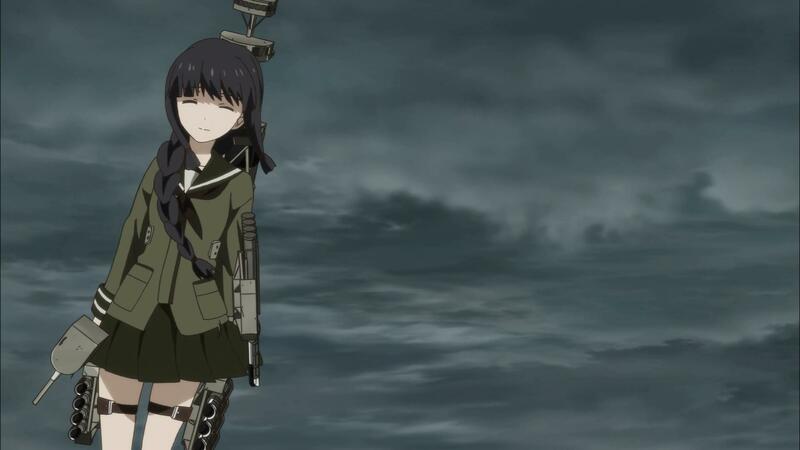 Waving at Fubuki, she reflects that she’s had the same nightmare since the announcement of the operation. 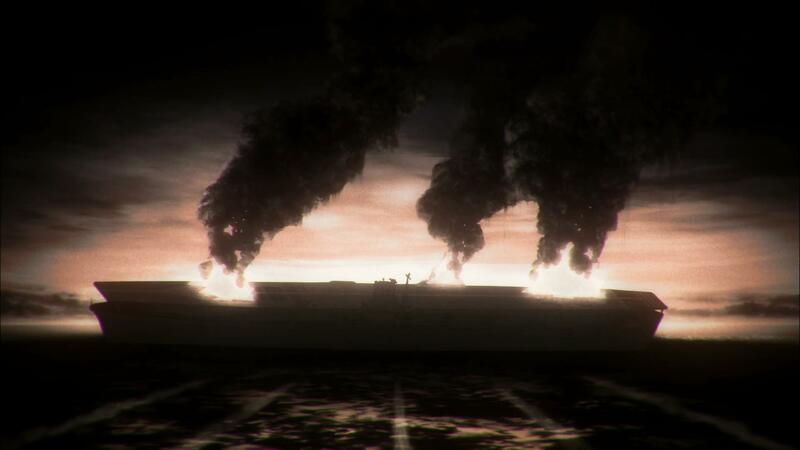 Nagato and Mutsu discuss the operation, with Mutsu asking for Nagato to finally make a decision. They are interrupted by Akagi coming in with a request. 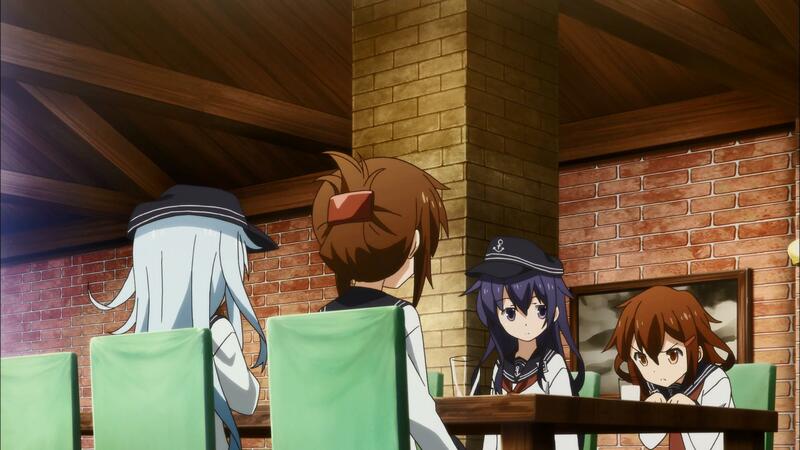 Elsewhere, the girls are trying their best to relax, with 6thDesDiv drinking milk (Ikazuchi being spurred on by the thought of Atago and Takao liking milk), and Mutsuki making a joke about Fubuki’s now voracious appetite flying over the remodeled destroyer’s head. 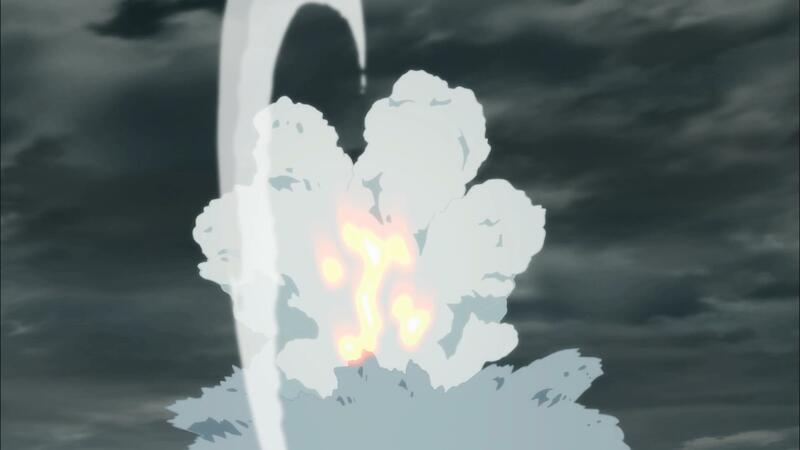 At that time though, Nagato announces the battle plan over the intercom. The main carrier strike force will consist of CarDiv1 and CarDiv2 with BBs Kongou, Hiei, DDs Yuudachi, Fubuki, and CLT Kitakami. 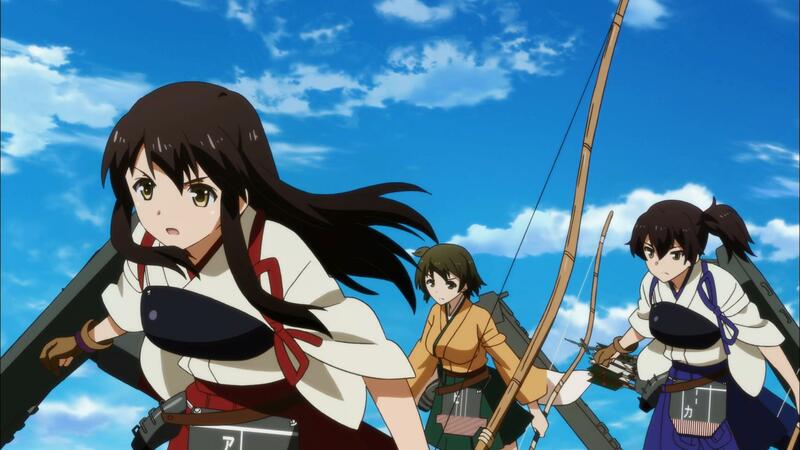 The main assault force will consist of Haruna, Kirishima, Ooi, as well as a task force from Truk led by Yamato. 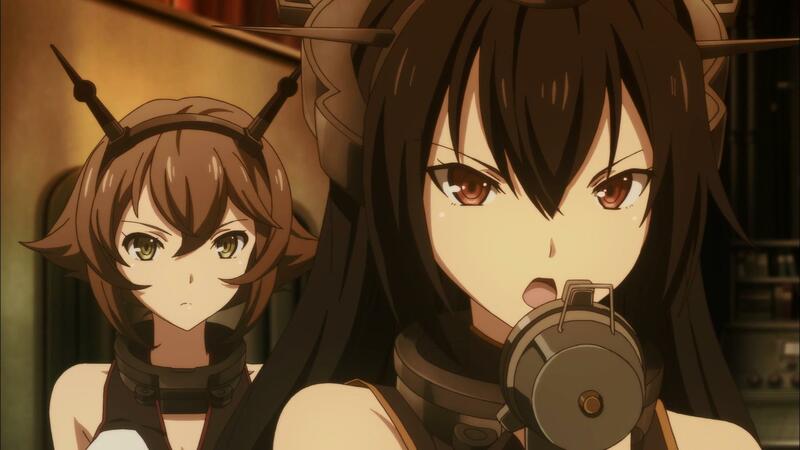 A diversionary attack on Abyssal Base AL will be conducted with the allied CVLs Junyou and Ryoujou, CAs Nachi, CL Kuma, Tama, and DDs Akatsuki, Hibiki, Ikazuchi, Inazuma. All others not deployed will stay to protect the base and surrounding sea lanes. 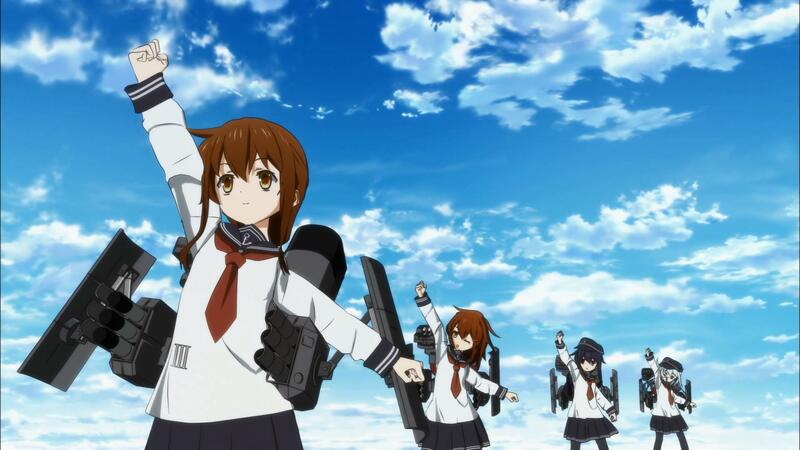 Finally being deployed on a mission that isn’t an expedition, 6th DesDiv is excited, while Jintsuu, Sendai, and Naka encourage Yuudachi and Fubuki. Back at the command room, it’s revealed what Akagi’s request was. While Fubuki isn’t going to be removed, Akagi explains that she feels fate is pushing them to an outcome to repeat something from the past. She’s unsure what she is, so by changing the lineup of the escorts, she intends to fight against that yoke placed on her by fate. Nagato takes her words to heart, she herself having felt that same urge to follow an unheard of voice telling her to go to Base MI. 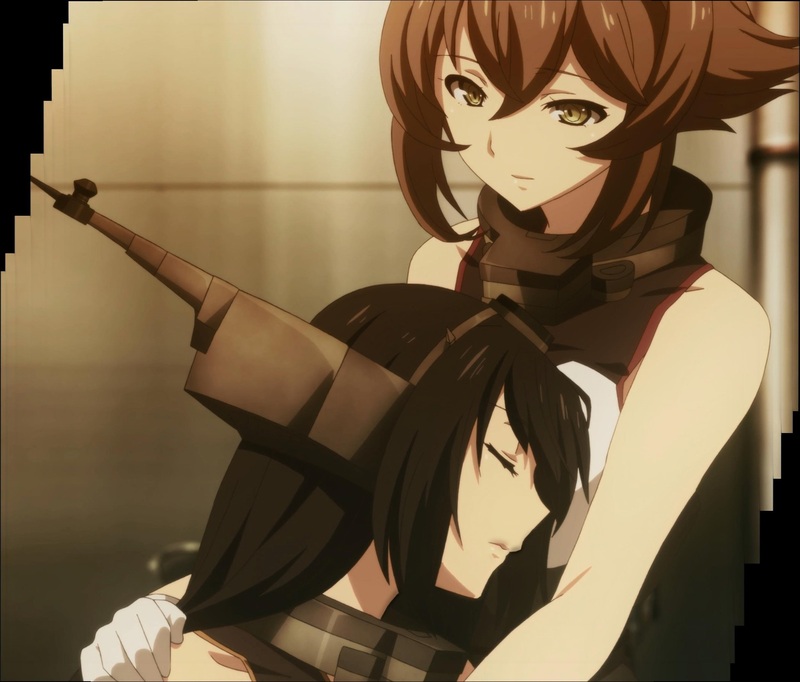 Wrapped in Mutsu’s arms, she contemplated her existence. 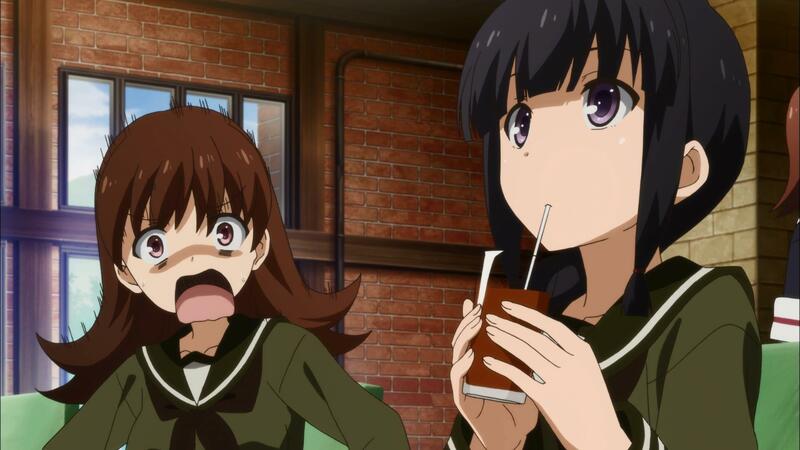 Elsewhere, Ooi catches up to Kitakami. 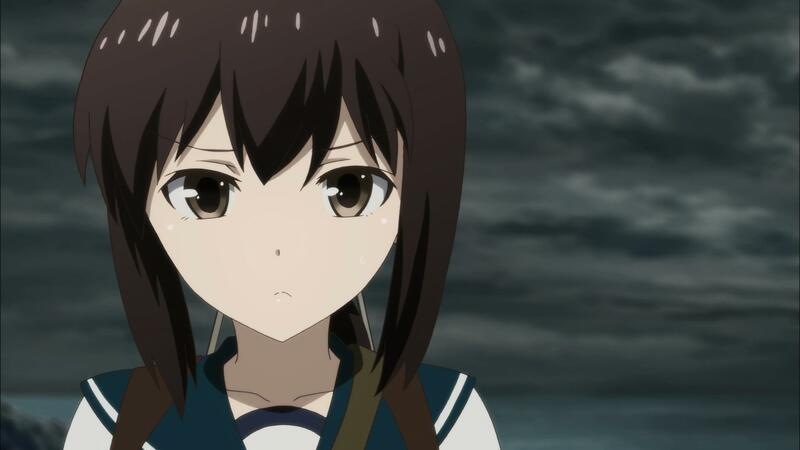 Worried and annoyed, Ooi thinks Nagato is jealous. 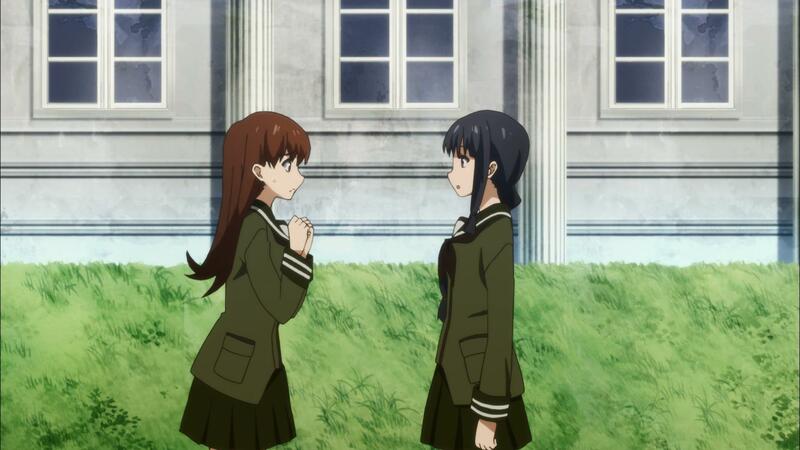 Kitakami though brushes it aside, noting that it would be fun, to see who would sink the most, and walks away, leaving Ooi. 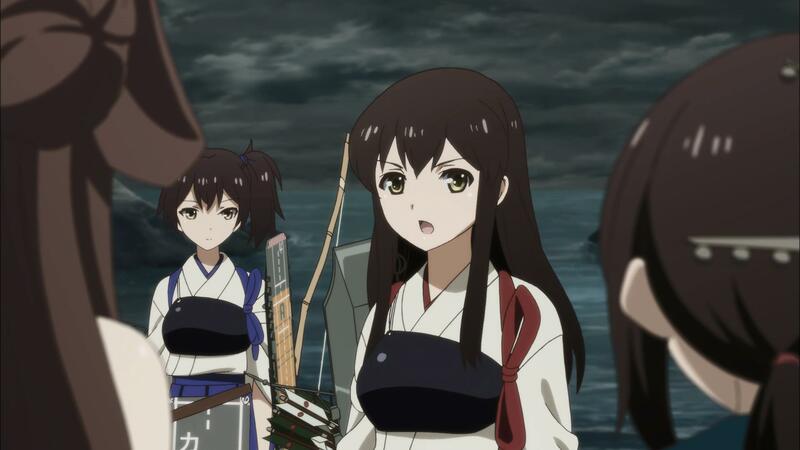 Back on the pier, Fubuki and Akagi talk, with Akagi telling the destroyer that she should be proud of her efforts and hard work. She says she loves the Naval District, and everyone in it. Coming to the district meant she was able to work hard due to everyone else. Akagi notes that she may not know why the Admiral choose Fubuki, but she has to live up to the DD’s expectations. 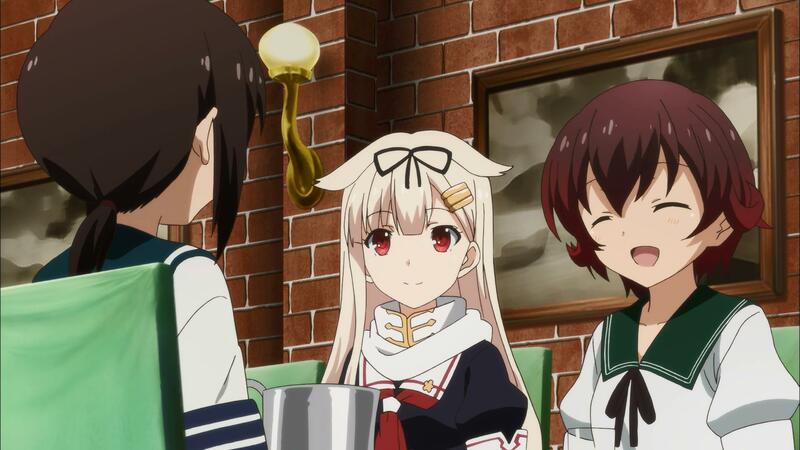 The next day, Yuudachi and Fubuki joins Mutsuki at a memorial, praying for good fortune, and the three promise to come back to each other. The fleets deploy with a bit more tense mood than before. As the groups split, Tama asks what Nachi has in her hand, which were mission orders that are to be opened once they get to their area of operations. 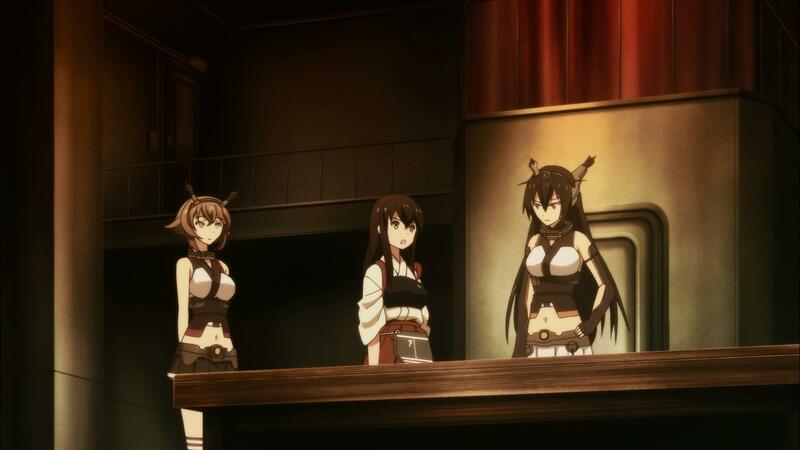 Back at Truk, Yamato deploys, with Zuikaku and Shoukaku at the wings, and Taihou overlooking the bay. 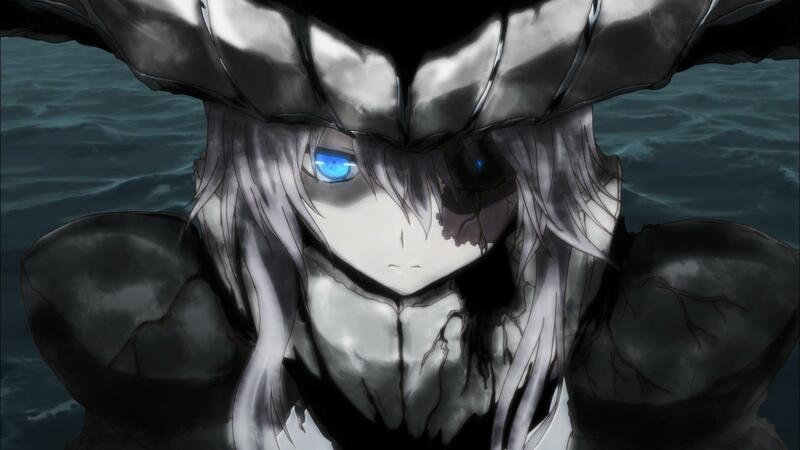 Awaiting them at MI, was the damaged Wo-class Flagship Kai, and Airfield Hime. At a reef near MI, recon planes have not yet ascertained the location of the enemy fleet, with Tone apologizing that her catapult had malfunctioned. 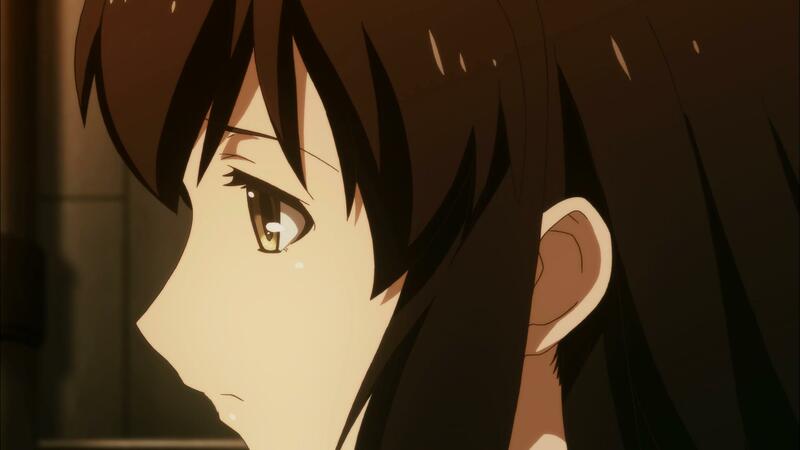 They also note that Kirishima’s group should’ve met with Yamato’s group. Akagi, being the overall commander, is faced with a tough choice of staying to wait for their heavy assault force, and continuing forward. 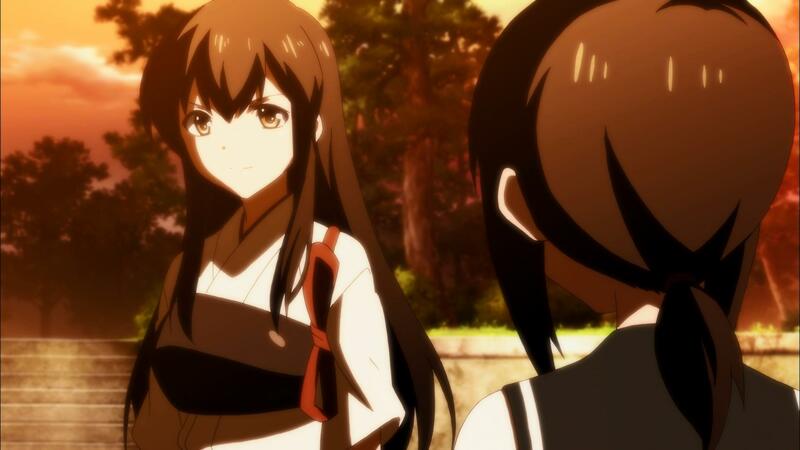 With Kaga’s urging, she leaves Fubuki and Kongou behind to wait for the main force. 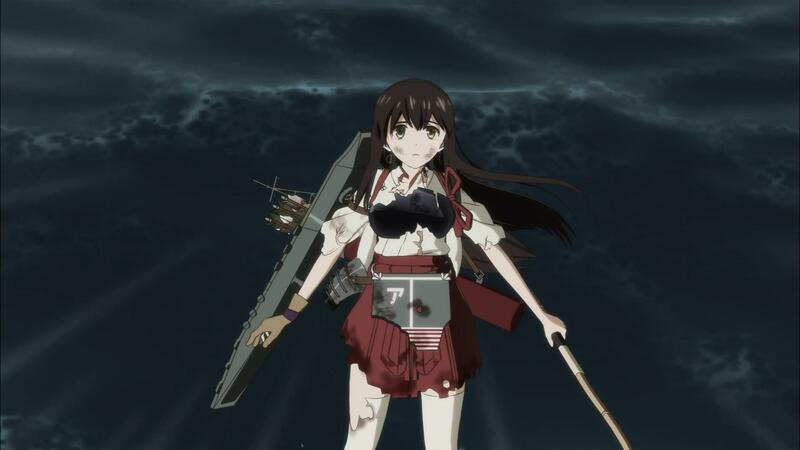 Protesting, Akagi cuts her off and tells Fubuki that in order to succeed, the two forces need to work together. 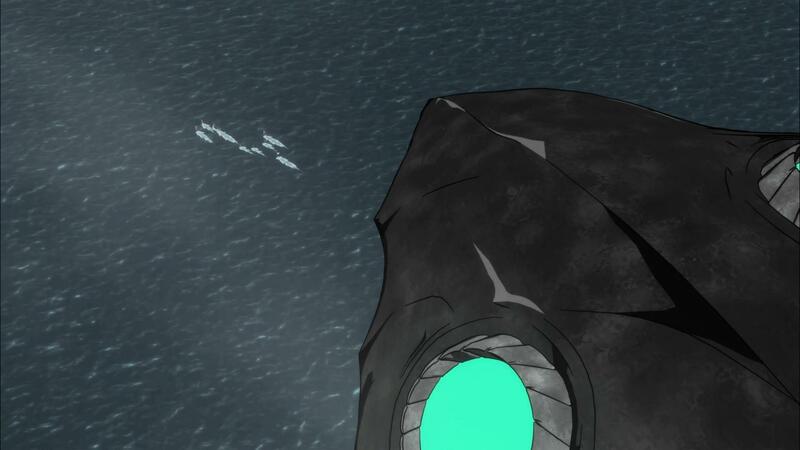 Heading towards Base MI, Chikuma’s recon plane alerts the group to the presence of Airfield Hime. 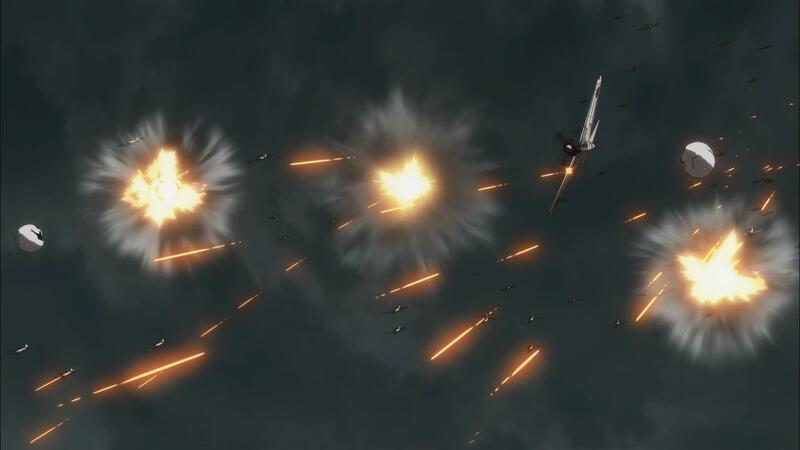 Noting that if they strike now, they can neutralize her and make it easier for the main assault force, they launch a devastating attack on Base MI. After launching a second wave though, an Abyssal recon plane spots them and the Flagship Wo launches her own attack. 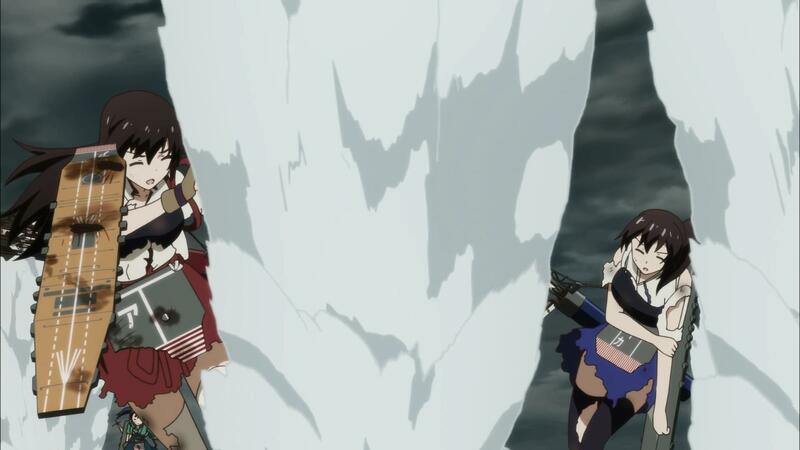 Back at the rendezvous point, Fubuki still can’t get over her unease, remembering how Zuikaku and Shoukaku had been split off and attacked when their escorts were away. 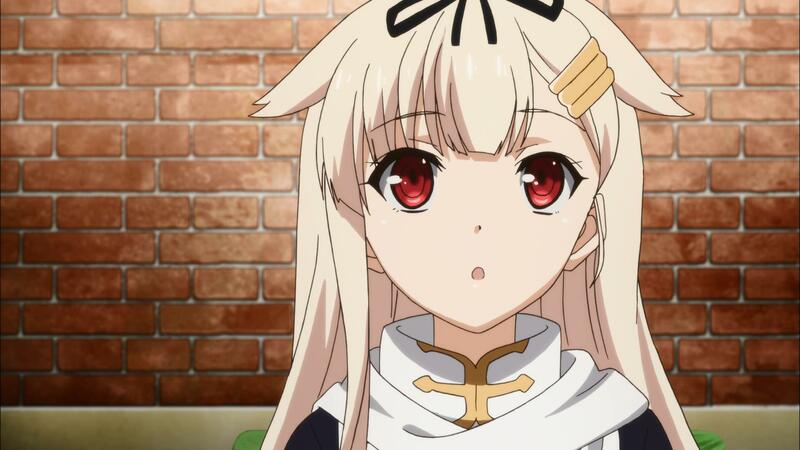 Back at the main force, Yuudachi spots the enemy and they take massive damage. 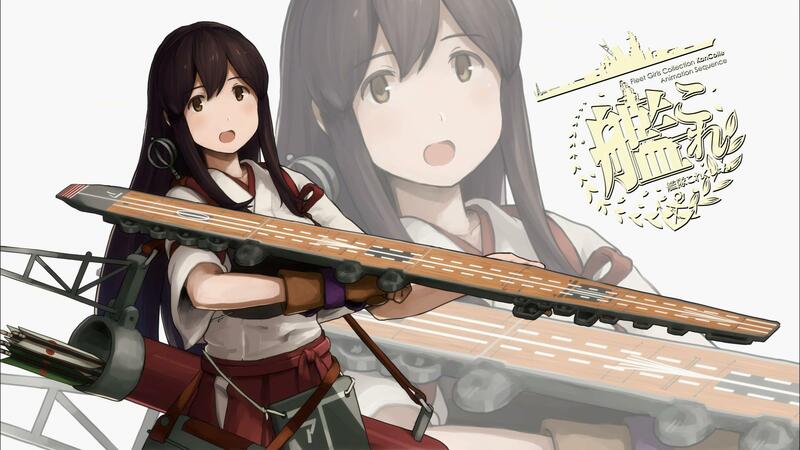 Akagi loses her flight deck and her string is cut, while the other carriers are in several state of damage. Unable to launch escorts fighters, the other girls do their best in defending the carriers. Now joined by an enemy task force, Kitakami absent-mindedly calls for Ooi for a combo attack, only to be hit (and supposedly sunk). 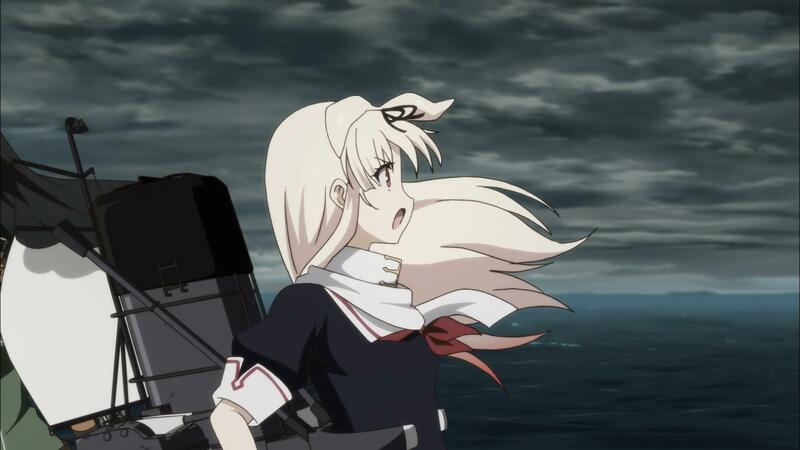 The episode ends with Akagi noting that she may be unable to beat fate as she watches an aerial bomb head towards her, and cutting to black. 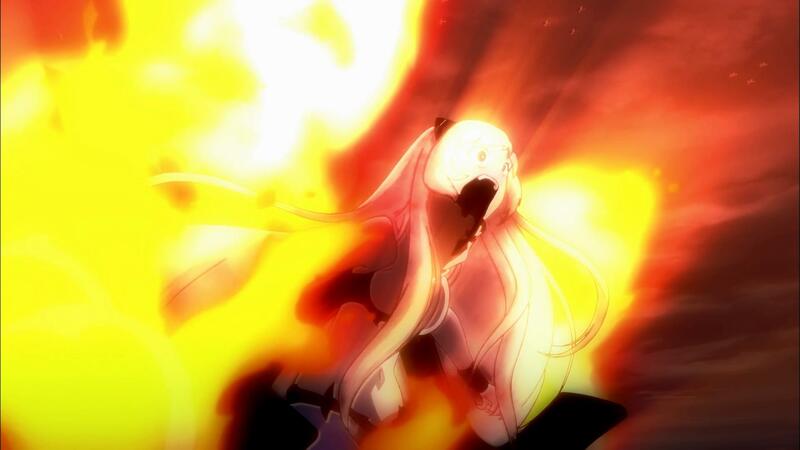 I’ve not seen this much vitriol over an episode since Episode 3 with Kisaragi’s death. I had been spoiled the episode before I saw it, so I guess my views were tempered, but in all honesty, I thought it was fine. I’ve long considered the series to be its own canon, apart and yet equal to the official work. I mean the official works vary in tone and setting, and a myriad other things like who or what the kanusu are. 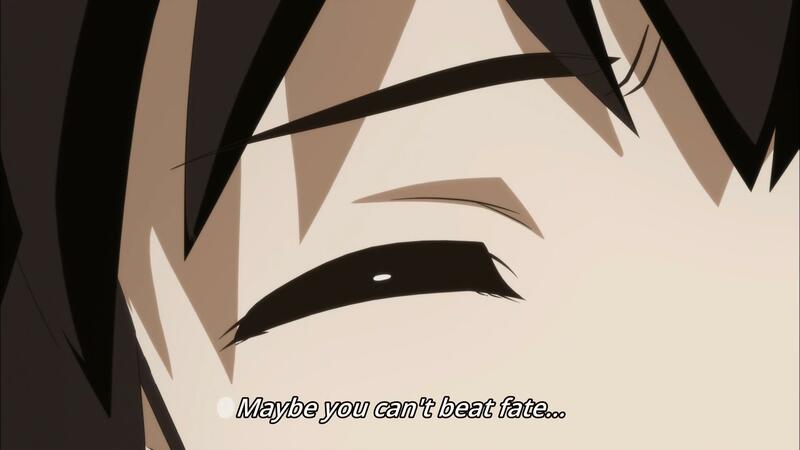 But that’s probably the biggest problem in KanColle’s anime adaptation. With a wildly varying story bible, it’s always been a lose-lose if they wanted to try to appeal to fans. There is the vocal right-wing Japanese who would want a complete change of fate to their ships, and those who don’t. There are going to be the players who don’t want their girls hurt, or aren’t happy that this girl or another was not featured, etc. So this is why I guess I’m more optimistic. I try to not let my biases from knowing a bit of the game come when I watch. It’s probably why I’m more ready to drop a series rather than bad mouth it outright. 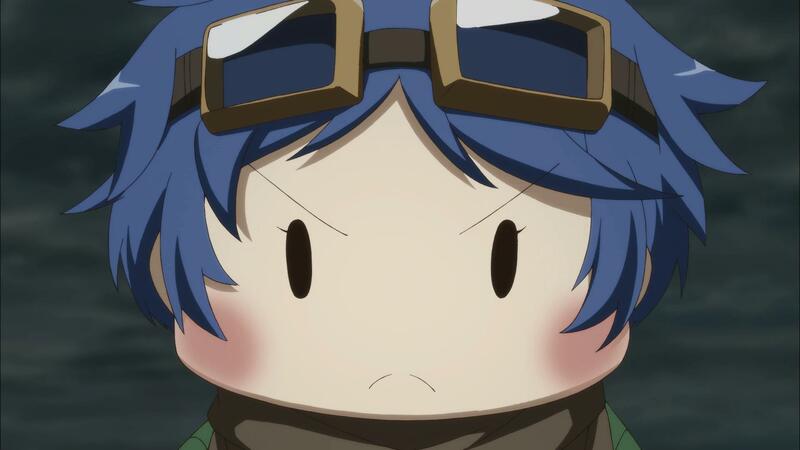 Anyways, the episode was, rather meh at the beginning. 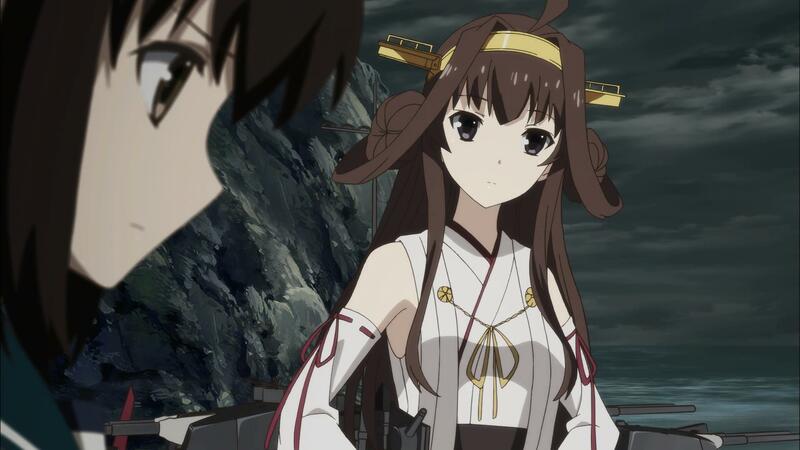 The latter half of the episode isn’t something to write home about like the Kongou-centric episode from before, but it was a bit of a deja vu thing. Now we’re seeing Akagi repeat Midway, compressed in about 12-15 minutes. I did think Akagi took some risks and is paying for it. No CAP or anything, especially that deep into Abyssal territory. Splitting Fubuki away, especially since she’s spec’d out to be an AA platform was also kinda dumb to me. She would’ve been more useful in defending the carriers long enough for them to deploy interceptors. 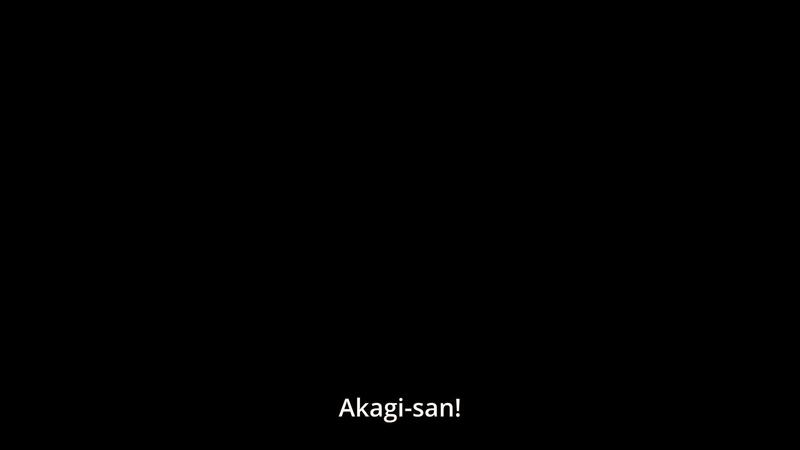 This is especially stupid, from an audience perspective, if Akagi is genuinely trying to change fate. 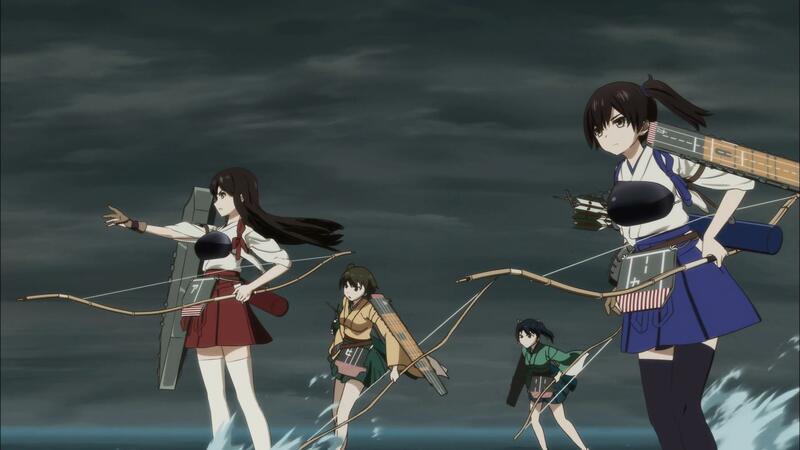 I imagine Fubuki and Kongo will join the fray, before it becomes a big melee with a shout out to the other girls coming in and being introduced with each sinking a ship. 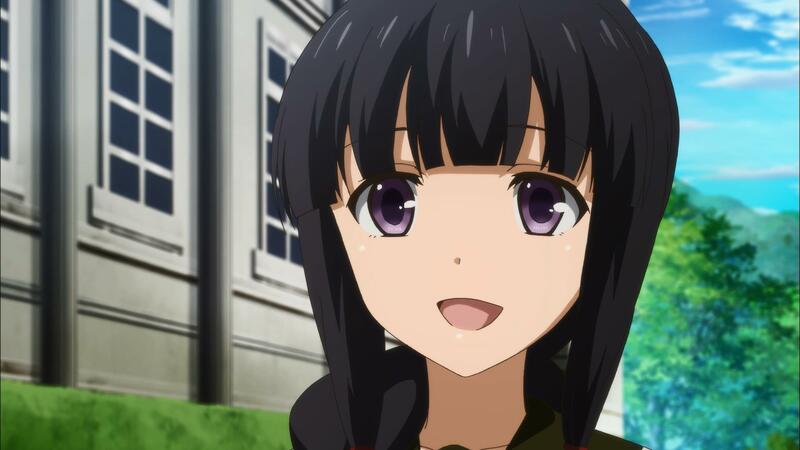 And probably Ooi going batshit crazy when she realizes that Kitakami is injured (or dead). But am I disappointed? Well I think I answered that in the past few episodes. 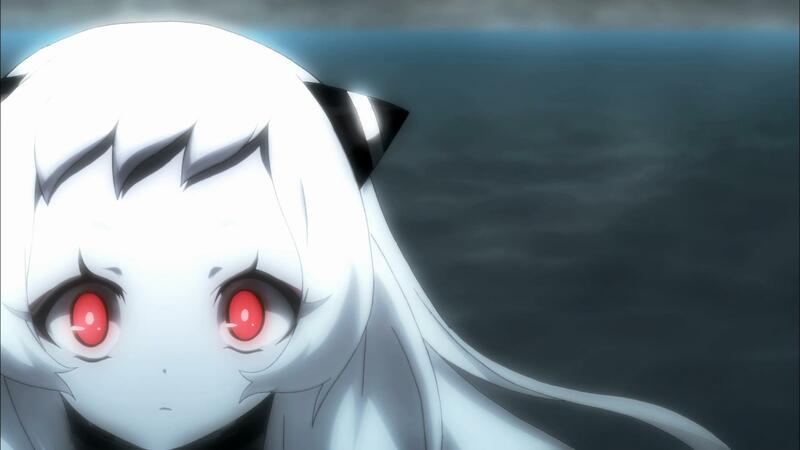 I’m an optimist with the series, I knew it would be a very difficult, if not impossible, to make an anime series on a runaway hit like Kantai Collection. You can’t please everyone I guess, and a lot of people aren’t liking the anime mainly because it annoys them in some way. This character hasn’t gotten much screentime, let me not care when she dies or disappears, etc. I hate that view. Not with the girls we’ve come to know and love while we played. I guess that’s a bit of a whiff of elitism to me. The ‘secondary’ fans as a friend of mine always refers to them as. Regardless, I write this for the few who aren’t players of the game, and this is my thoughts. I thought the episode wasn’t as horrible as many are making it out to be. Fubuki seems to have bounced back now she’s been remodeled to her Kai Ni, while I’m liking the pillar of stability that is poi. 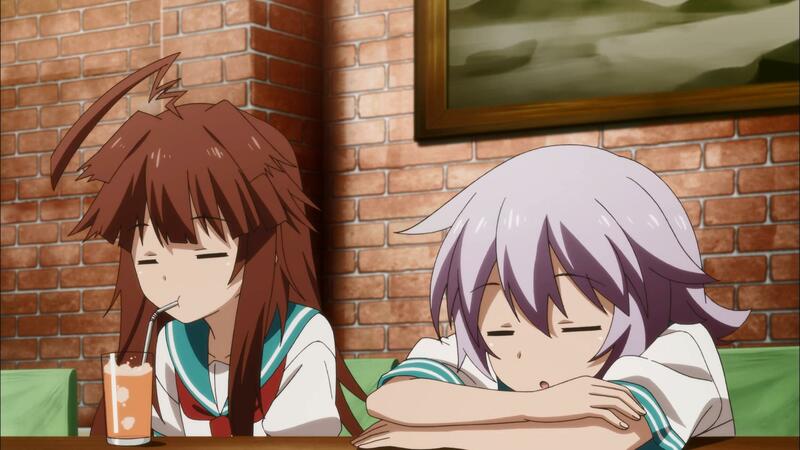 Mutsuki I think isn’t as sad on being left behind by her two friends, now that she knows they’ll still be the same destroyers from the beginning, while Akagi’s attempts to change fate and Nagato’s slight realization that she’s being pulled by something that may or not be her desires comes in as a bit of a poignant scene, especially when she is in Mutsu’s arms. As for me? 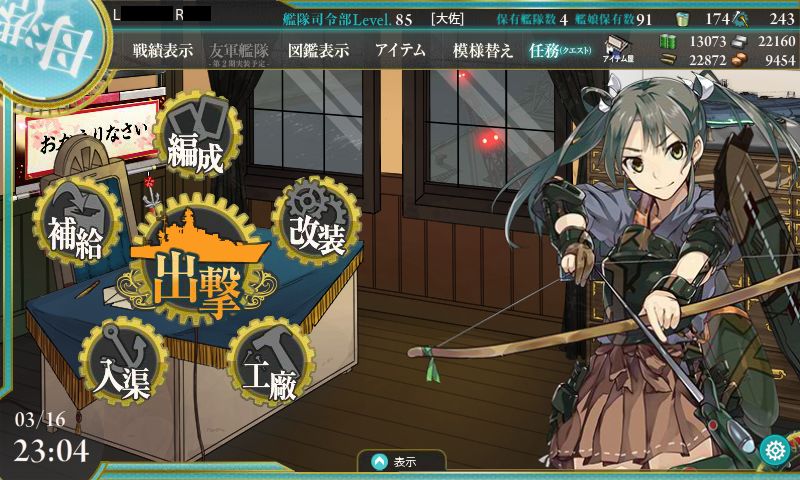 I’m a bit embarrassed to say that I met my lovely Zuikaku in a ‘I DON’T KNOW WHAT I’M DOING’ moment, putting in 555/555/555/555 into the ship craft sliders and tossing a flamethrower to craft my very first ship for the training quest. That was December 7th, 2013. I was quite happy that she made it into a speaking role, if only for a few episodes, because to me this twin-tailed, outmatched by even light carriers, etc. I don’t care. She’s my first crafted ship, she’ll be my first married ship. 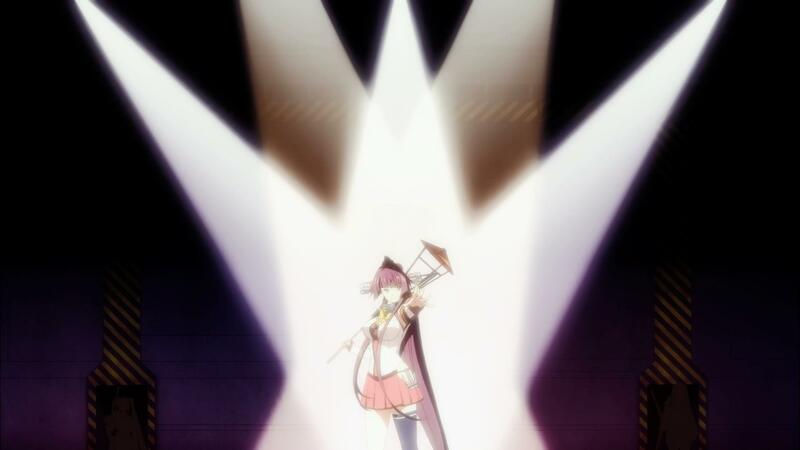 Also, the last line Nagato says in her deployment speech is also the title of Akagi’s character song. 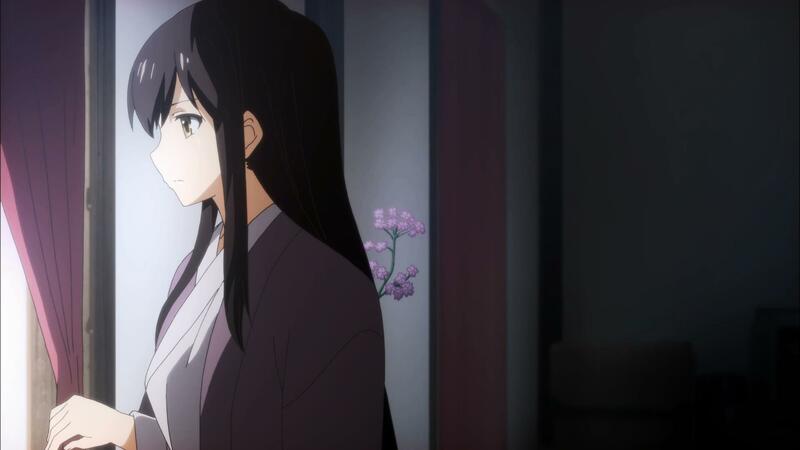 (暁の水平線に (Akatsuki no Suiheisen Ni) ) Thanks to the folks on the Kancolle Thread in World of Warships NA for pointing that out.